Imagine it’s a dreary winter morning and you find yourself struggling to escape your fluffy winter comforter. You ask yourself, “Do I really want to go to yoga class tonight?” Your friends and co-workers encourage you to get out and take care of yourself but today it’s hard to find motivation. Thriving is wanting more for yourself than apathy and working towards it, in any capacity. Thriving is understanding that you’re worth more than baseline emotional stability, and recognizing there’s a plethora of things you can do to begin your journey to thriving. Thrive Week, taking place from February 4 to 8, includes programming and workshops dedicated to mental health and wellness. The week of events is an invitation for those who want more for themselves. The Mental Health Outreach team from the Student Wellness Centre spoke with Cassie Fischer and Blair Wilson, two counsellors at the centre. Among the issues facing students, they spoke about taking care of yourself, barriers to self-care that students may experience, and resilience. “Self-care is very dynamic and it looks different for different people on different days,” said Fischer. Some days self-care might be going to a yoga class or meeting with friends for dinner. On other, more difficult days, self-care might be basic tasks like brushing your teeth. Common barriers to self-care are often remedied through counselling. “Perfectionism tends to get in the way of practicing self-care in a university context,” said Wilson. University can be challenging, and putting extra pressure on ourselves does little to help. It’s important to work on your sense of resilience and understand how it benefits you within the university context. There are multiple ways to grow your resilience. “To tune into your own needs and do your best to meet them, that is a means to grow your resilience. So you can face the world with a bit more steadiness than you might have otherwise,” explains Fischer. Thrive Week promises to continue the discussion of mental health beyond the individual, and recognize the barriers created by society. We invite you to begin your journey to self-care and resilience, and we hope you’ll make that first step with us during Thrive Week. Imagine it’s a dreary winter morning and you find yourself struggling to escape your fluffy winter comforter. You ask yourself, "Do I really want to go to yoga class tonight?" Your friends and co-workers encourage you to get out and take care of yourself but today it’s hard to find motivation. Thriving is wanting more for yourself than apathy and working towards it, in any capacity. Thriving is understanding that you’re worth more than baseline emotional stability, and recognizing there’s a plethora of things you can do to begin your journey to thriving. <a href="https://wellness.mcmaster.ca/thriveweek/"><strong>Thrive Week</strong></a>, taking place from February 4 to 8, includes programming and workshops dedicated to mental health and wellness. The week of events is an invitation for those who want more for themselves. The Mental Health Outreach team from the Student Wellness Centre spoke with Cassie Fischer and Blair Wilson, two counsellors at the centre. Among the issues facing students, they spoke about taking care of yourself, barriers to self-care that students may experience, and resilience. "Self-care is very dynamic and it looks different for different people on different days," said Fischer. Some days self-care might be going to a yoga class or meeting with friends for dinner. On other, more difficult days, self-care might be basic tasks like brushing your teeth. Common barriers to self-care are often remedied through counselling. "Perfectionism tends to get in the way of practicing self-care in a university context," said Wilson. University can be challenging, and putting extra pressure on ourselves does little to help. It’s important to work on your sense of resilience and understand how it benefits you within the university context. There are multiple ways to grow your resilience. "To tune into your own needs and do your best to meet them, that is a means to grow your resilience. So you can face the world with a bit more steadiness than you might have otherwise," explains Fischer. "Resilience is not only a practice, but it can also serve as a lens through which we see our experiences… focusing on the way people adapt and grow even in the most trying and difficult circumstances." Thrive Week promises to continue the discussion of mental health beyond the individual, and recognize the barriers created by society. "Sometimes when we’re talking about self-care we place a lot of responsibility on individual people to practice it, and if they’re not practicing it we blame people for poor mental health outcomes…It’s important to broaden that to a larger definition and really think about how the people and communities around us help nurture self care as a priority." 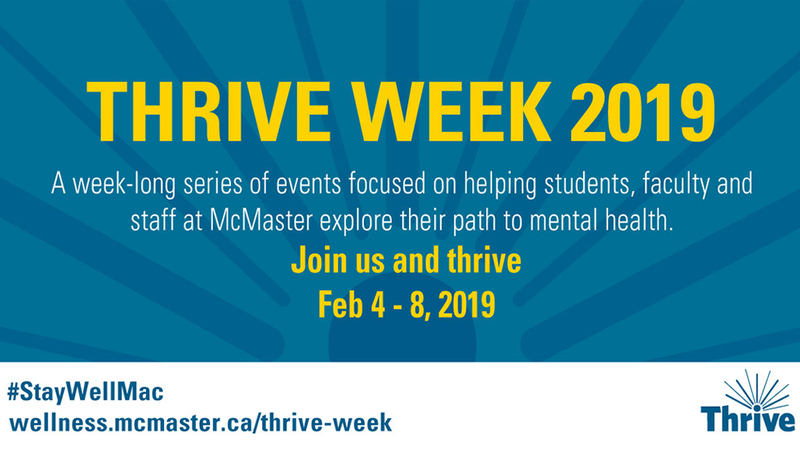 For the first time, McMaster is joining a number of Canadian colleges and universities in hosting its own Thrive Week. McMaster’s Student Wellness Centre and Healthy Workplace Committee will be collaborating with a number of campus partners to host a diverse set of programs including: <ul> <li>#MacMoves Giant Zumba</li> <li>safeTALK training</li> <li>Mistakes Happen! Seminar with Senior Leaders</li> <li>Body Mind Spirit Circle</li> </ul> And many others! A full list can be found here: <a href="https://wellness.mcmaster.ca/thriveweek/">https://wellness.mcmaster.ca/thriveweek/</a> We invite you to begin your journey to self-care and resilience, and we hope you’ll make that first step with us during Thrive Week.